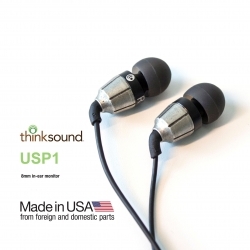 THINKSOUND™ announces the release of the new USP1 monitor series in-ear headphones that are made in the USA from domestic and imported parts and eliminates throw-away packaging from their earbuds. Somersworth, NH, February 15, 2018 --(PR.com)-- The all-new USP1 in-ear monitors is the first headphone for the brand that is made in the USA. The USP1 features an 8mm dynamic speaker driver and a hand-poured pewter housing. The pewter housing is a departure from their usual wood headphones. The USP1 features upgraded acoustics for more accurate sound reproduction and a wider sound-stage; consistent with the other headphones in the monitor series line. The result is a clear, detailed sound with tight bass; while not being fatiguing after long listening periods. Perfect for use while on the go or just to relax and unwind. The USP1 monitor series in-ear headphones will be available in a single finish – a black aluminum baffle mated to a hand-poured pewter housing. Included are four different-sized silicon earbuds to ensure a comfortable fit, carrying pouch for the headphones and accessories, and a steel hard case. “Over the past couple of years, we have been trying to incorporate more and more parts that are made locally to help local businesses and significantly reduce our carbon footprint. These sources are allowing us to be a lot more consistent in production and reducing our defect rate and material waste too,” says Fournier. “Moving part of our production to the USA was always something I wanted to do. We worked hard trying to figure out the right process and identify the right partners to create a product I am really proud of,” says Fournier. THINKSOUND offers several in-ear headphone models, an award-winning on-ear monitor and a growing line of accessories. THINKSOUND began with a simple goal; to create incredible sounding headphones with the smallest eco-footprint possible. We take our environmental impact as seriously as we do our audio products. All packaging is crafted from recycled materials, with minimal plastic components. Our headphones feature PVC-free cables and wood from renewable sources. The result is great sound that you can feel good about. THINKSOUND was founded by audio and consumer electronics industry leaders with over 25 years experience bringing exceptional audio products to market. We invite you try our headphones to experience the difference that quality craftsmanship and attention to detail make. THINKSOUND is owned and operated by TIMBRE SOUND LLC. For additional information please contact hello@thinksound.com or visit www.thinksound.com.